When two or more than two atoms are combined together with chemical bonding, they form a molecule. The molecule is a smallest possible unit of any substance, which can’t be further divided. But, still, retains the same properties of the original substance. For example, water is composed of H2O molecule. So, H2O is a smallest possible unit of the water that can retain the properties of the water. 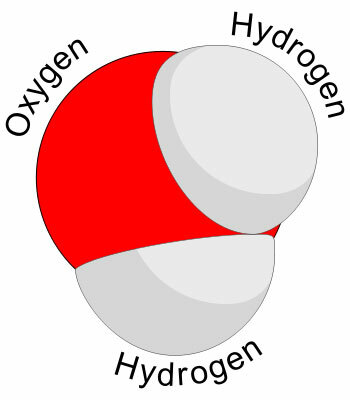 If you further break the water molecule, you will get oxygen and hydrogen atoms. Both of these atoms don’t have the properties of water. Everything around you is made of molecules. These molecules are the result of the chemical reaction between atoms of same and different elements. When a molecule is formed, it doesn’t resemble in properties with original atoms that formed it. Molecules can be formed from atoms of the same element, as well as atoms of the different elements. For example, table salt molecule (NaCl) is made of two different elements; sodium and chlorine. Whereas, oxygen gas molecule (O2) is made of atoms of the same element; the oxygen. Molecules are formed as a result of chemical reaction between atoms. These chemical reactions cause the atoms to stick together with the help of chemical bonds. Chemical reactions occur because atoms want to complete their valence shell. For that reason, they form chemical bonds when they collide with each other with sufficient force. There are basically two types of chemical bonds; Ionic bond and Covalent bond (read more at chemical bonding). Oxygen gas at ground level is made of O2 molecules. But, in the upper atmosphere, it is made of O3 molecules called Ozone. DNA are the very long molecules. Molecules be broken down into atoms in a process, known as decomposition reaction. Abdul Wahab, "Molecules," in Science4Fun, April 13, 2019, http://science4fun.info/molecules/.